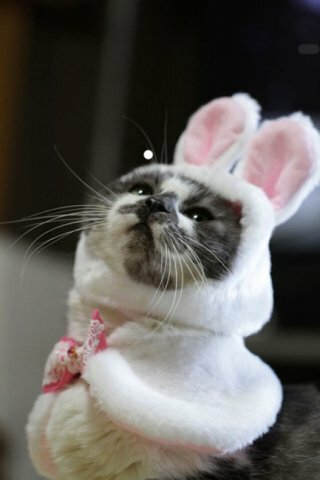 The exact origins of the Easter Bunny aka Peter Cottontail, are buried in obscurity but the connection to the Easter holiday appears to lie in the fact that the rabbit is an ancient symbol of fertility and the creation of life. Historians believe that the German immigrants of the 17th century brought the idea of an egg-laying hare named Osterhase to the Pennsylvania colony, and from there it spread across the settlements of the new republic. It's that time of year for cleaning out the closets, donning lighter clothing, paying taxes and planting seeds and bulbs. 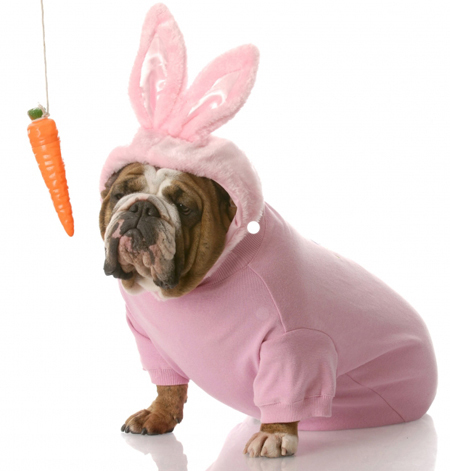 That proverbial harbinger of Spring, the Easter Bunny, is preparing for his annual hop along the bunny trail and into the hearts of delighted children and adults who dare to let a little magic into their lives. 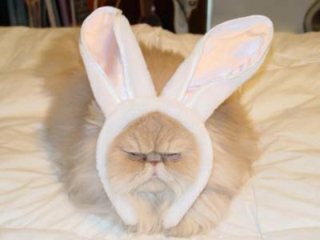 Sometimes, however, this old coney takes other unexpected forms as creatures (or at least their owners) dare to imitate this adorable portent of springtime. 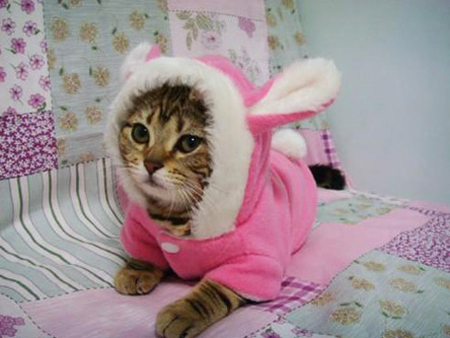 Humans and their pets form deep bond sof love and affection but does this emotional commitment extend to wearing holiday costumes? Aye, there is the rub, or should we say costume? Whether it does or it doesn't, solidarity demands a suspension of disbelief, and while their owners might like to think otherwise, pets really don't understand the meaning of the holidays their owners choose to celebrate. This is probably because convictions run weak in the dog world beyond the immediate need for affection and food and shelter, and of course for cats the need to please is ambivalent at best. 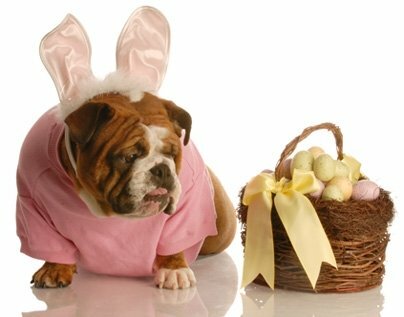 Our adorable furry companions below have gone the way of their beloved two-legged caretakers in developing similar temperaments and attitudes about Easter and other affiliations far beyond sharing bones and catnip. These adorable pooches do have something to say in their own canine way about taking on the guise of Peter ottontail, albeit without benefit of words. The "eyes" not only have it: so do the facial expressions as indicated below. 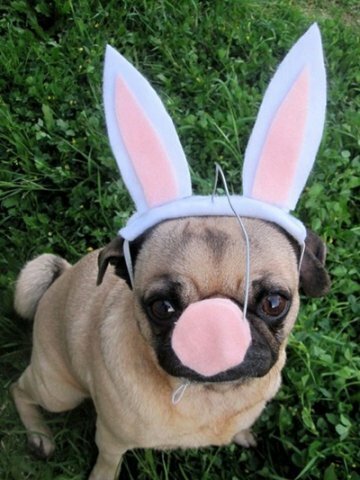 Who wants Easter eggs? I want meat and...kibble! I ate the rest of the costume! 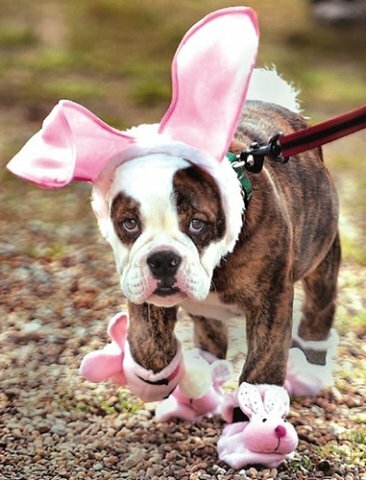 Some of our costumed canines seem rather sad about the welcome of Spring and its most significant celebration, or maybe for them it's just about the costume. Consider the temporary fate of these three fine canines below. Talk to me. I have so much to tell you! I like Christmas better. More kibble, more toys and...no ears! I don't like carrots! Get me outta this thing and bring me my bone! 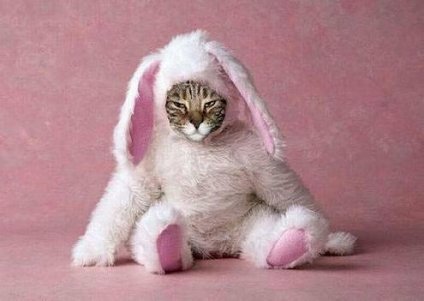 At least in the case of dogs, pleasing their owners might compensate for the discomfort of wearing an Easter bunny costume, but for cats, it's a whole other matter.Pleasing others is not cat-like even though some of their antics cannot help but do so. 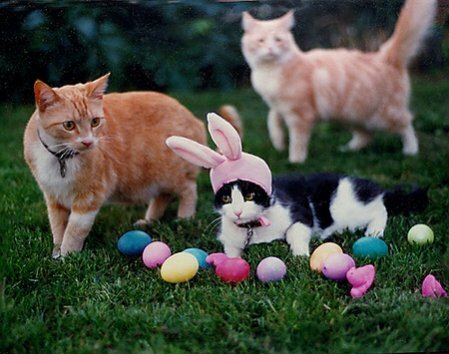 Consider the following felines traped in Easter bunny finery and dying to be released. There has to be a mouse in here somewhere! Please, please please, get me outta this thing! 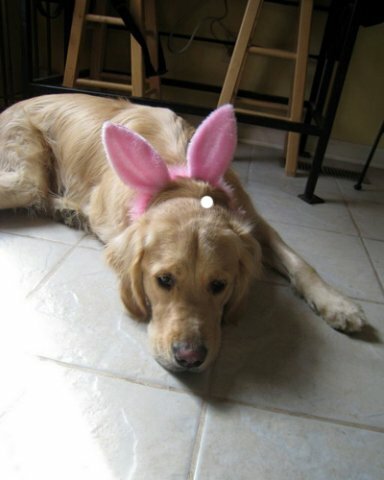 I only agreed to do this because the dog won't recognize me. 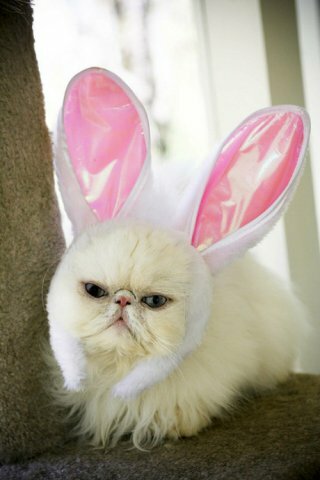 I am not an Easter bunny; I am a Persian cat. Remember and don't ever do this to me again. How humiliating can you get? I wonder what they did to to the bird and the dog! We love our animals and they love us. While they might prefer to go through life without donning additional garb; au naturel, so to speak, we can't resist dressing them up and showing them off. it's like those thousands of baby pictures family members feel forced to sift through at every holiday gathering, swearing that each is more adorable than the one that came before. Small price to pay for the smiles these creatures bring to our hearts every day that we share with them, which by the way, makes every single day a holiday in its own right. Originally published April 2014, and updated February 2016.